Coconut and curry leave both are such good ingredients! That smell of fresh curry leaves... it is so irresistible. Well, who is asking us to resist? 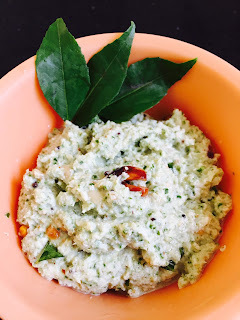 Let's prepare this delicious chutney with fresh coconut and curry leaves. Run coconut and curry leaves in a blender. Add curd and salt also. The quantity of curd depends on how thick you want your chutney to be. Add ground nut. Fry it on low flame. After a minute add chana dal and urad dal. Let them become slightly golden brown. Add this tadka to your chutney. Serve it with idli, dosa, vada etc.